Tom Clancy’s The Division 2 is certainly one of the biggest games Ubisoft is set to showcase at E3 2018 during their own conference (scheduled to take place on June 11th, 1 PM Pacific Time at the Orpheum Theater in Los Angeles). We don’t really know a lot about this sequel so far, other than its launch date (by March 2019) and the promises from Massive that it will feature lots of content and more endgame than its predecessor did when it launched. However, the above poster from the E3 2018 venue (first shared by Twitter user Manning13) provides a wealth of information ahead of the official reveal. For instance, the setting seems to be Washington D.C. with the Capitol Building visible on the horizon. 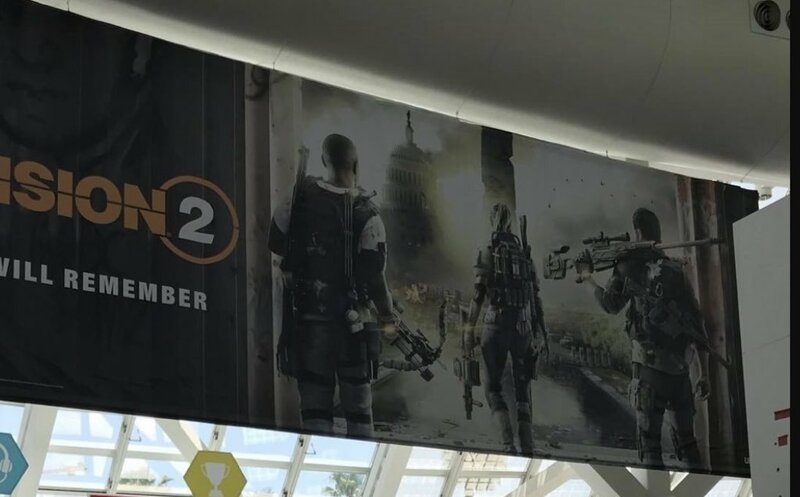 Of course, it’s too early to say whether The Division 2 will only be set in Washington D.C. as opposed to New York, but it appears to be likely. In the image we can also see three player characters, suggesting that the base group size might remain limited to three (instead of the traditional four). More interestingly, though, the player character on the left clearly sports a crossbow while the one visible right in the middle carries a grenade launcher. These could be special weapons and new additions for this sequel, providing increased gameplay variety and allowing different play styles. We’ll get a lot more information about The Division 2 tomorrow when Ubisoft Massive will officially pull the lid off this sequel. The developers will have to go toe-to-toe against Bioware’s Anthem, now set to release on February 22nd, 2019 and fairly similar in structure, not to mention Bungie’s Destiny 2 and its expansions (with Forsaken due in early September). Which game are you most excited about for the time being? Let us know in the comments!